Winter often rolls casually into the DC area, but then anchors itself firmly - immovable and resolute. In that seemingly endless freeze, I cling to thoughts of the hidden life sleeping in the bare branches and frozen ground. Potential is pent-up and the key word for me becomes ‘endurance.’ Though each year I start my course with plenty of resolve to pace myself, somewhere in the midst of snow shoveling and dragging weeks of tense muscles braced against the cold, the winter wilt begins and I lose my stride - somehow reduced to inching forward against bitter headwinds, dreaming of tropical beaches. Then suddenly one eventual day…hope! A warm sun appears and for a few delightful hours my heavy coat and I part ways. Of course, that first fine day is a just a tease - a fleeting vision or a glad prophecy to lean towards, to grasp in faith. The intermittent sun sparsely punctuates the calendar, a jerky rhythm of stops and starts - one day warm, five days cold, watching highs and lows and counting. And the last flurries of snow drift here and there. But finally on one perfectly random day like today, it becomes an absolute certainty that winter is really and truly gone. The earth has turned, and spring is facing fully towards me, gushing out warmth and light everywhere. My frigid marathon ended, I gratefully clutch a bouquet of first-time-this-spring moments: sunning with morning tea, discovering the pointy lily-of-the-valley shoots piercing up through the crusted soil, leaving the studio door wide open. One deep fresh breath and I drop to the damp ground like some spent athlete in desperate relief at crossing this yearned-for finish line. 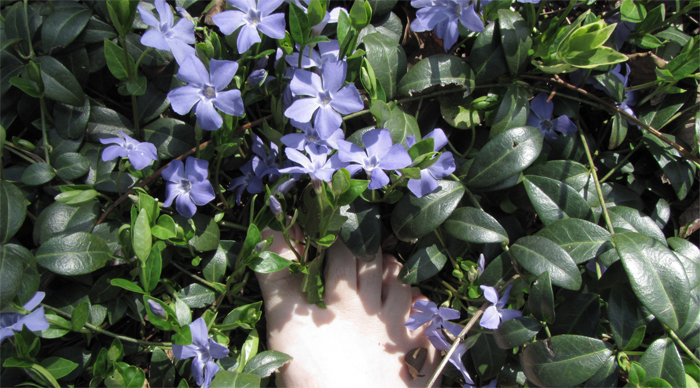 The penetrating sunlight pulses warmly into my face and I am barefoot in the cool blooming periwinkle.